The Asus ZenBook gets the Skylake treatment while keeping its low price. Last year we declared the Asus ZenBook UX305 the best budget ultrabook of 2015, for delivering performance and quality that belied its price. 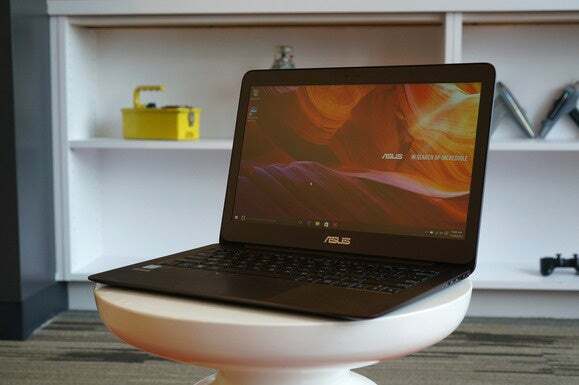 It's no surprise Asus has barely altered the blueprint for the 2016 model. The most notable difference is the CPU. The previous model's Broadwell-based Core M-5Y10 is now replaced by Intel's Skylake Core m3-6Y30 chip. Other than that, there's little detectable difference. That means while the previous model's strengths remain, so do its weaknesses. As before, the 13.3-inch, 1920-by-1080 IPS screen is merely average. There's still no keyboard backlighting, and the trackpad, while adequate, has an unusual bounce to it. Also, in the light of 2016, it would be nice to see USB-C on the UX305 for charging—and as a replacement for the funky micro-HDMI port. Fortunately, those annoyances are overshadowed by the UX305's assets. It's superthin at less than 13mm, as well as reasonably light at 2 pounds, 10.3 ounces. It continues to be fanless, and—the best part—it's still a hell of a deal. The new Skylake-based Asus UX305 is super thin and fanless too. Our Asus UX305 is priced at $699, with 8GB of RAM and 256GB of reasonably fast storage on its SATA M.2 SSD. That's a steal compared to other brands' offerings. Dell's XPS 13 at $799 gives you 4GB of RAM and 128GB of storage. HP's Spectre x360, meanwhile, matches the Dell's RAM and storage, but for $900. Then there's Microsoft's Surface Pro 4—also with 4GB of RAM and a 128GB SSD—which will cost you $1,030 once you've tacked on a keyboard. To be fair to Dell, HP, and Microsoft, their devices each offer something that the UX305 doesn't. The XPS 13 has a wickedly small footprint and packs a full Core i5 Skylake chip with Thunderbolt 3. The HP gives you the same Core i5 as the Dell, plus a touchscreen and the ability to flip the screen 360 degrees. The Surface Pro 4, well, that's a tablet, right? All three also have backlit keyboards. But here's the thing: For people on a tight budget, a lot of those premium features aren't worth the extra dough. Not when the UX305 delivers the bread and butter of a good computing experience, with its additional storage and RAM. Of course, the CPU also matters. 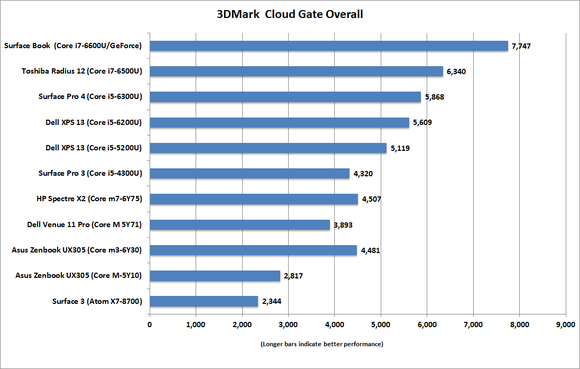 You're no doubt wondering how the UX305's Core m3 compares to the Core i5 in competing models. As always, it depends. To test the Core m3's mettle with office drone tasks, I turned to PCMark 8 Work, and the results aren't surprising. Anyone who uses a computer for work knows that once you get enough RAM, an SSD, and a reasonably fast CPU, you'll have no problem pushing around Microsoft Word, PowerPoint, and most common business apps. 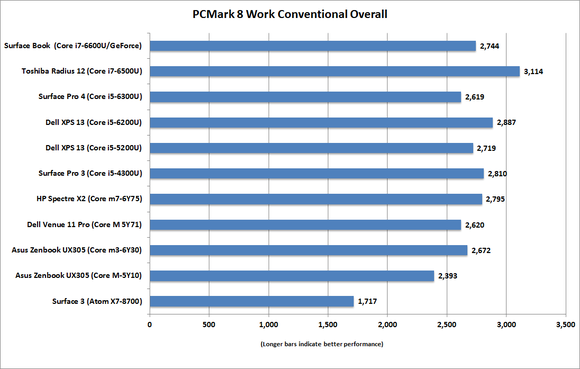 The PCMark 8 results highlight this: The UX305's Core m3 performs closely with the Core i5 and i7 chips in the pack. You have to dip down to an Atom X7 before you really feel the pinch, and even that isn't a deal-breaker for everyone. For most Office tasks, you'd be hard pressed to notice a difference between a Core i7 or Core m chip. As this is the first Core m3 laptop we've reviewed, I was curious about its performance with something more CPU-intensive. For that I turned to Maxon's CineBench R15 benchmark. This test renders a single 3D scene using all of a CPU's cores. It's a pure CPU benchmark in that the memory and storage performance don't matter much. The results are interesting. Last year's Broadwell Core M-5Y10 performs nearly identically to this year's Skylake Core m3-6Y30. Both outpace Dell's Venue Pro 11 with its Broadwell Core M-5Y71, as well as HP's Spectre X2 with a Core m7-6Y75. On the surface, it might seem strange that the two better CPUs performed worse, but consider that the Spectre X2 and Venue 11 Pro are both 2-in-1s. All of their computing parts, including the CPU, reside under the screen. Heat concerns prevent the CPU from being pushed as hard as in a traditional laptop, such as the UX305. Still the UX305's m3, as well as all the other mobile CPUs here, show a notable drop-off in performance from the Core i5 and higher chips. This correlates directly with the mobile parts' absence of fans. Before this sways your buying decision, let me point out that the CineBench test is a heavy workload that the typical laptop user won't run. If you don't anticipate doing 3D rendering, heavy video editing, or any other task that strains the CPU, the lack of a fan shouldn't have a noticeable effect. The Core m and Core M fanless CPUs lag behind Core i5 and Core i7 chips in pure CPU performance. 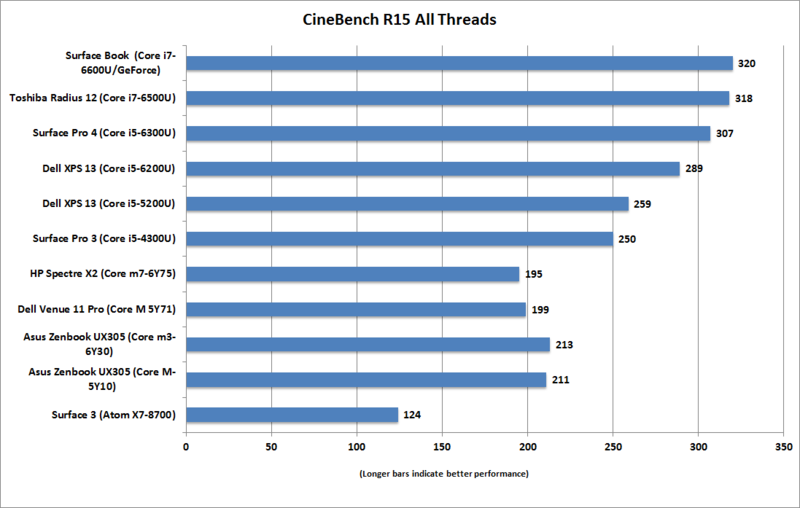 While CineBench is a pure CPU test with fairly predictable results, our graphics test revealed some curious findings. The newer Skylake-based Core m3 with its Intel HD Graphics 515 is dead-even with the Core m7 in the HP Spectre X2. Both are also dead-even with the older Haswell-based Core i5-4300U in the Surface Pro 3. Furthermore, while the older Broadwell-based UX305 was dead-even with the newer Skylake UX305 in pure CPU performance, there's a huge difference between the two in graphics performance. I was critical of the original UX305's graphics, but I'm even more so now that I see how closely it tracks with the Atom X7 chip. Paramount to any laptop is battery life. Normally, I'd test this with MobileMark 2014, a pretty realistic simulation of work-related tasks, including the time spent reading documents and messing around, say, looking at your phone. But MobileMark 2014 has been giving me fits since the latest Windows patch, so I resorted to a video rundown test. 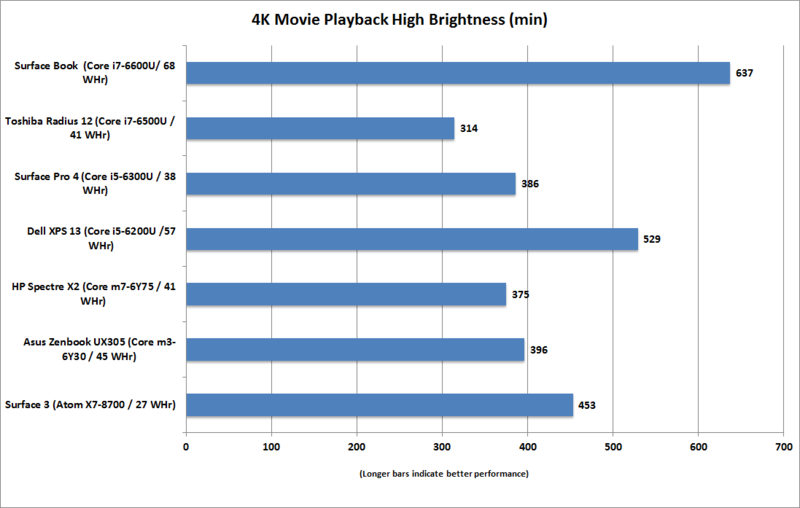 I played a 4K-resolution .MOV file using Windows 10 Movie & TV player. The test is done done with a pair of Samsung earbuds in place, volume on, and the brightness set to a relatively bright 250 nits. That's not maximum, but it's a comfortable brightness setting for home or office during the day. The benchmark chart features all of the units I've tested so far. For context, I've also included the watt-hour capacity of each device's label. Think of the watt-hour as the fuel tank in each laptop. 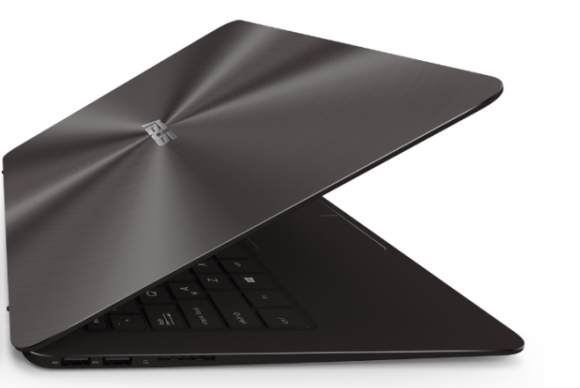 The larger the "fuel tank" the longer the battery life, as with the new Skylake-based Dell XPS 13. The UX305's results were merely decent. Despite its larger battery and Core m3 chip, the UX305 barely skates by the Core i5-based Surface Pro 4. The worst performer here is the Toshiba Radius 12, but that's to be expected with its UHD 4K screen. Overall, the UX305's battery life is adequate; you'll still be able to watch about 6.5 hours of video on it. But that's the very definition of meh. Battery life on the UX305 was fair in our challenging video playback test. If 2015 was a break-out year for many laptop makers, 2016 so far appears to be steady as she goes. Some vendors have chosen to make tiny changes to bring laptops more in line with newer technologies such as USB-C, while others aren't making any changes beyond swapping the CPU. In the UX305's case, that's really not a bad thing. For what you get in performance, build quality, and portability, the UX305 is still easily the best budget ultrabook of the year. So little has changed in the Skylake-based Asus ZenBook UX305 that this photo of the previous model still applies.